What Do Companies Get With a Custom Payment Disbursement Solution? Large enterprises typically make tens of millions of dollars in disbursements every month – and selecting a partner to streamline and protect those payments is a major consideration. A recent survey¹ found that 79 percent of organizations are looking to convert disbursements from paper checks to electronic payments, to take advantage of increased efficiency (88%), reduced costs (82%), and fraud prevention (60%). In making a change of this scope, a business may look for a payment disbursement partner to provide expert tools that help them transition to more efficient payment methods and manage disbursements on an ongoing basis. Two main types of payments disbursement solutions are available to large enterprises: a standardized, out-of-the box solution or a customizable, agile tool for payment disbursement. While a standardized solution may meet basic disbursement needs for small and even mid-size companies, a custom payment disbursement solution is often the best way for large businesses to improve their processes. Disbursements fall into many different categories: payroll, commission, bonus and incentive, and travel or expense reimbursements may be made to employees. B2B payments must conform to different standards and insurance disbursements are specialized and regulated, requiring an entirely different process as well. A custom payment disbursement solution can create different, personalized disbursement avenues based on your business’s payment needs, ensuring that each type of payment is fully supported by standard functionality, instead of requiring time-consuming workarounds. For example, airlines that need to issue payments in the form of travel and hotel vouchers can use a custom payment disbursement solution to ensure staff can quickly and easily issue vouchers from airports and standalone offices around the country. Enterprise funds disbursement solutions are complex, with hundreds of different types of functionality built to accommodate the diverse needs of large organizations. Not every business needs every piece of functionality. An out-of-the-box solution may be cumbersome, requiring intervention from staff to change settings or verify processes, making payments unnecessarily complicated and time-consuming. A custom platform, on the other hand, can tailor features, functionality and automation tools to meet the specific needs of the organization, allowing for process streamlining for improved efficiency and control. A custom solution will incorporate only the payment needs that an organization requires, so you don’t have to pay for or deal with unnecessary functionality that complicates your processes. Most traditional industries that use checks and ACH may have little use for vouchers, virtual cards, or emerging payment methods, for example. However, companies in the transportation industry, like airlines, often use vouchers, while companies in other industries may prefer alternative methods such as reloadable debit cards or instant payments. In another example, large companies with a significant unbanked population in their staff may use payroll cards as a way to help their employees save money by displacing paper checks. The Global Fraud Index² found that $3.3 billion had been lost by merchants due to account takeovers in Q2 2017 alone, marking a 45 percent increase in account takeovers and a 5.5 percent increase in total fraud over the previous year. Disbursements fraud is an enormous concern for organizations in all industries; however, it can disproportionately affect large enterprises, as they have regular high-value asset disbursements and funds transfers, and the combination of high value and high volume makes them attractive targets for fraud. Custom platforms provide large enterprises protection with 24/7 fraud monitoring and compliance tools, to reduce the risk of disbursements fraud. Custom solutions typically come with a higher level of support than out-of-box solutions, with dedicated representatives and bilingual customer support teams that can resolve any user issues before business operations are affected. For businesses that are dealing with high volumes of payments to employees, vendors, customers, and partners, that support can greatly improve efficiency. It can also alleviate the technology burden on staff so they can focus on more strategic pursuits. 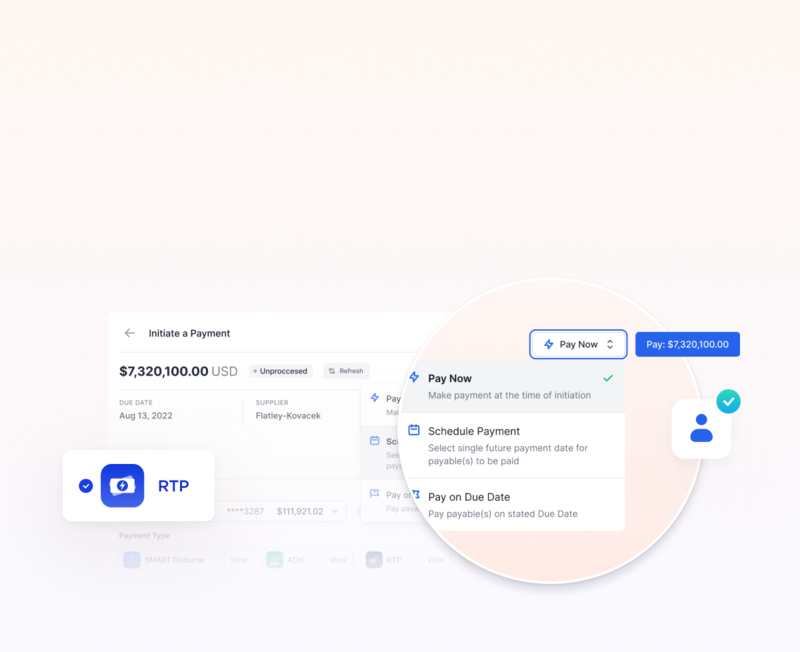 Custom payment disbursement tools offer more options to create integrations and APIs to help disbursement applications speak with other systems already used by the organization. A custom solution can be made to speak with IT systems, payroll software, or operations tools to create a higher level of functionality throughout the organization. Specialty applications can also be created based on business needs, including custom applications, self-service portals, and tailored experiences to support strategic corporate objectives. Large enterprises are in a unique position compared to small and mid-sized companies. Not only do they have larger, more robust tech stacks, they also have specialized needs. Custom ERP instances, tailored HR software, and other systems are implemented and built out specifically to meet each business’s needs. A custom payment disbursement solution is more likely to fit into the tech stack you already have, enhancing and streamlining existing processes instead of forcing your staff to adjust to the new software. The result is a platform that not only fits your needs, but improves your payment processes to increase efficiency.